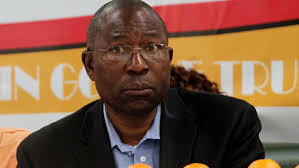 THE Coalition for Democrats (Code) has nominated Renewal Democrats of Zimbabwe (RDZ) leader Elton Mangoma as its presidential candidate in the 2018 elections. The coalition also elected Zapu leader Dumiso Dabengwa as the supreme council chairperson, who also becomes the leader of the grouping. The coalition has nine parties, namely, Zapu, RDZ, Progressive Democrats of Zimbabwe led by Barbara Nyagomo, Zimbabweans United for Democracy Party (Farai Mbira), Democratic Assembly for Restoration and Empowerment (Gilbert Dzikiti), African Democratic Party (Marceline Chikasha), Mavambo/Kusile/Dawn (Simba Makoni) and ZimFirst (Maxwell Shumba). Both Dzikiti and Mbira, who have a separate arrangement with the National People’s Party (NPP), absented themselves from the elective meeting. The leaders expressed confidence of winning the 2018 elections although they said they would not distribute the seats, but would support the most popular candidate in a particular area. Makoni, Chikasha and Shumba are other members of the supreme council, while the post of vice-president will be filled at a later stage. Mangoma said they would focus on turning around the economy and job creation, among other priority issues. “Fear is one of the greatest challenges in this country and as we go to the issue of voting and voter registration, fear is being used in our people,” he said. Mangoma said they would take the Zimbabwe Electoral Commission to task to ensure transparency in the management of elections. Dabengwa, who dismissed speculation that he would join NPP, said he was firmly behind Code. He said when looking at other political players in the country, Code was the best alternative going forward. “We are going through into the elections collectively, but obviously, as our coalition candidate (Mangoma) will be leading the electoral team, while I concentrate on making sure the party gets the necessary support so that we can achieve success,” he said.